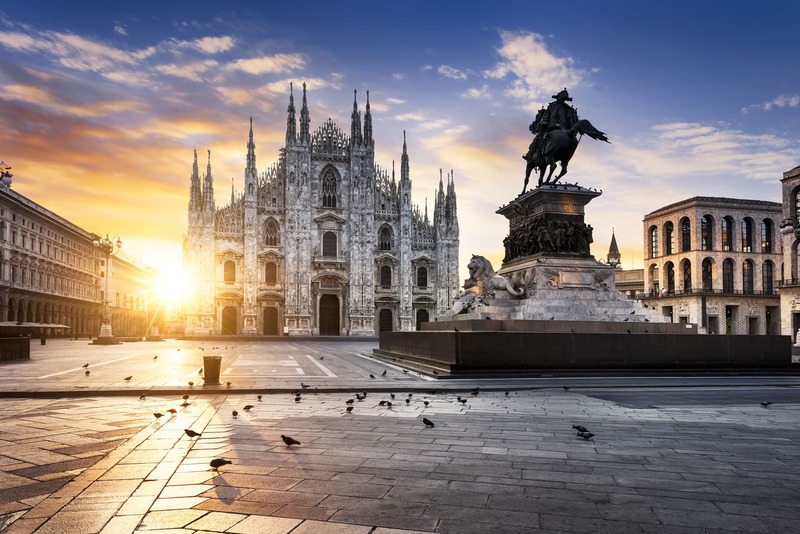 Milan is not just Italy’s capital of chic but has a lot more to offer with its surprising variety of art and architecture. A half day walking tour is essential to get into the city’s atmosphere but do not miss some of the suggested highlights listed below. Be inspired by the Duomo, the Last Supper and the most interesting religious buildings. The spiked gothic cathedral in pink Candoglia marble called Duomo (3.600 statues and 135 spires!) shows an imposing interior with magnificent treasures. The near by Church of Santa Maria presso San Satiro is almost a hidden gem in a niche but a must see for the illusion effect given by its false apse, an early example of trompe l'œil, attributed to Bramante. San Maurizio al Monastero Maggiore Church, due to its sumptuous interiors rich in frescoes from the school of Leonardo, it has been dubbed the ‘Sistine Chapel of Milan’. Santa Maria delle Grazie Church where Leonardo da Vinci’s Last Supper, undoubtedly Milan’s best-known attraction, is preserved. By admiring (only 15 minutes time per admitted group!) the peculiarities of the work you’ll feel part of the scene where the iconography reveals the expressions of consternation of the disciples because of Jesus imminent betrayal. Saint Ambrose Basilica, one of the most ancient churches in Milan,was built by St. Ambrose (the city’s patron saint) in 379–386, in an area where numerous martyrs of the Roman persecutions had been buried. The current appearance is in Romanesque style with a red brick exterior. Visiting the interior is an illuminating experience: among its jewels there are the Golden Altar, a 9th century masterpiece and a late Roman sarcophagus, traditionally known as Stilicho's Sepulchre, with magnificent friezes, featuring animal and human figures, as well as vegetable and fantastic motifs. The Basilica of Sant'Eustorgio was for many years an important stop for pilgrims on their journey to Rome or to the Holy Land, because it was said to contain the tomb of the Three Magi or Three Kings.Probably founded in the 4th century, the church was later rebuilt in Romanesque style. Behind the apse is the most striking feature of the church, the Portinari Chapel (1462–1468),one of the most celebrated examples of Renaissance art in Lombardy with frescoes by Vincenzo Foppa and a 14th-century marble sepulchre by Giovanni di Balduccio. Art, art, art..nothing but Art!! Are you ready to visit surprising museums in sumptuous palazzi or in industrial archeology sites? Let’s start with the Renaissance style Castello Sforzesco, one of Milan’s landmark, home to the precious artwork “Pietà Rondanini” by Michelangelo, his final and uncompleted sculpture. The Museum of Ancient Art, the Collection of antique Paintings and the Sala della Asse painted by Leonoardo should not be missed. Brera district, the Montmartre of Milan, preserves its wonderful Pinacoteca containing one of the most important art collections in Italy including Dead Christ by Mantegna, Raphael’s Wedding of the Virgin, Supper at Emmaus by Caravaggio. The Pinacoteca Ambrosiana is located in an elegant 17th century palace. It preserves The Musician, early painting by Leonardo, artworks by Bellini, Bramante, Botticelli, Raphael, Titian, Caravaggio and Tiepolo.The library contains the Codex Atlanticus by Leonardo. Don’t forget to leave time for new collections too. Old galleries have rivals in the form of Museo del Novecento and Gallerie d’Italia – both inaugurated since 2010. The first museum houses 20th-century Italian and international artworks from Modigliani to Matisse. The bank-owned Gallerie d’Italia displays masterpieces by Canova and Hayez in a sumptuous series of frescoed palazzi, opposite La Scala opera house. The neoclassical Villa Belgioioso is a magnificent setting for the works of Manet, Renoir, Dufy, Modigliani and many others. Between La Scala Opera House and the heart of the fashion district (Quadrilatero della Moda) 3 smaller museums are among the hidden gems of the teeming downtown. The Scala Opera Theatre Museum is a surprising curiosity for opera lovers with its set designs, musical instruments, libretti, portraits and scores. The Bagatti Valsecchi Museum was the private neo Renaissance mansion of two ancient art collectors while the Museum Poldi Pezzoli was the home of a wealthy Milanese who bequeathed his art collections to the state. The refined rooms display furniture, clocks, jewels, paintings by Botticelli, Bellini and the exquisite Portrait of a young Woman by Pollaiolo. Backstage of the Teatro alla Scala Opera House has been located since 20 February 2001 in the former industrial settlement of the Ansaldo steel plants. Most of the handmade works for production (carpentry works, set assembly, costume design,etc) are carried out and shown to visitors in this gigantic 20,000-square-metre facility. Prada Foundation is a private contemporary art exhibition complex recovered from a 20th century distillery located in the southern part of Milan. The project was developed by Prada’s longtime architect, Rem Koolhaas.